Wearing leather to the office is no longer ground breaking, however, we must be very careful when doing so in order to look professional. To me, leather is like animal prints; it can look a tad wild but also like animal patterns, it's a classic. Well-fitting and nice quality leather or even vegan leather garments are timeless and of course, you will be able to wear it with pretty much everything in your wardrobe - and that's exactly the type of pieces we should consider for the office. I personally would recommend wearing your patent or metallic leather garments only for your day off or for occasions that don't involve the office, of course, with the exception of shoes and accessories. The look you that are seeing today was styled around my leather skirt that I bought three years ago (see more looks here, here, here and here). My intention was to create a professional and fun outfit with this skirt and yet steering away from a provocative vibe. I was able to accomplish this by pairing my leather skirt with classic and yet chic pieces such as a striped silk blouse, quilted bag, and sling-back heels. As you can see, I styled this look with neutral colors in order to ground and yet compliment the black leather skirt. 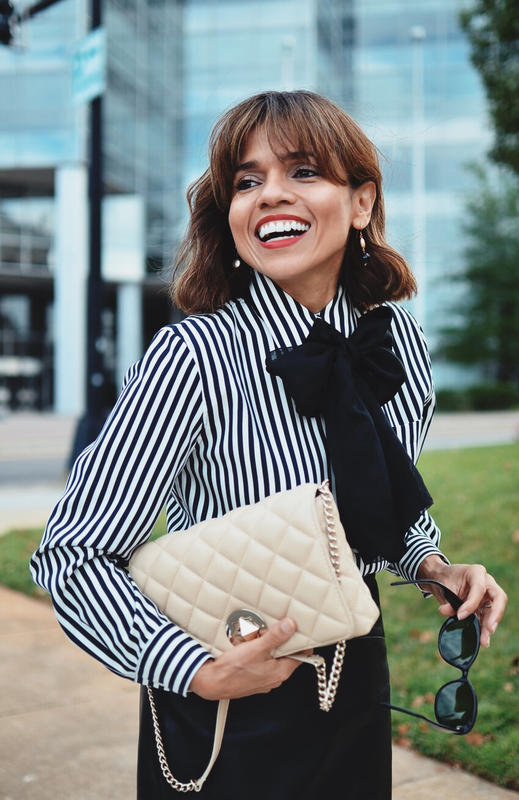 One of the things I love about wearing only neutral colors is that you can get away with over-accessorizing or wear bold pieces such as I did with my large chiffon bow and still not look overdone. But, if you aren't a fan of anything oversized around your neck, you can still recreate this look with a skinny scarf instead of a chiffon scarf. Skirt: Similar/Blouse: Similar/Shoes: shop here and suede version/Bag: Similar/Sunglasses: Similar/Earrings: Similar/Scarf: Similar.